John Crawford is admitted to practice in Minnesota and Wisconsin state and federal courts and North Dakota federal court. John Crawford counsels clients in cases involving insurance coverage, personal injuries, wrongful death, mental impairment/mental anguish, punitive damages and property damage. A significant portion of his practice is representing motor carriers, commercial truck drivers, and the motoring public. 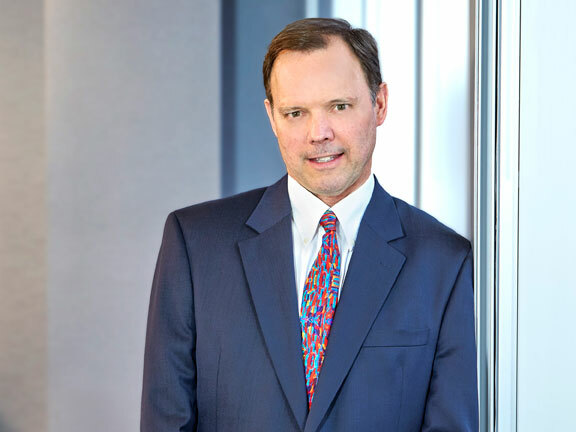 John is certified as a civil trial specialist by the Minnesota State Bar Association and is a board certified civil trial advocate by the National Board of Trial Advocacy. Since 1997, he has served as the Editor-in-Chief of the Minnesota Insurance Law Deskbook, a 26-chapter deskbook on insurance coverage. He is also a frequent speaker on insurance coverage and related issues, and served on the editorial board of the Journal of American Law on the topics of insurance and re-insurance. He is rated AV Preeminent® for the highest level of professional excellence by Martindale-Hubbell. Within a matter of months after taking over the defense of our insured, John resolved both a breach-of-contract lawsuit and a workers’ compensation claim by the plaintiff for a minimal amount. And in doing so, he included in the settlement agreement my company’s right to reimbursement from any money the plaintiff recovered from the at-fault third party. The amount of litigation expenses he saved my company was significant. He clearly put the interests of my company ahead of his firm’s. When an attorney for a passenger in another vehicle threatened to pursue my personal assets and a bad-faith claim against my insurance company for failure to settle within my policy limits, my insurer retained John. John methodically identified the important liability and damages issues, used his many years of experience to evaluate the case, and ultimately resolved the claim for less than my policy limits. The threat to my personal assets and the bad-faith claim evaporated. In addition to fending off the passenger’s bad-faith claim, John persuaded a jury to return a verdict fully exonerating me and finding the other driver was 100% at fault. As a result, the settlement amount paid to the passenger in the other vehicle was fully recovered, along with double our costs. I would strongly recommend John for the most difficult and challenging personal injury cases. After my elderly father was involved in a auto-bike accident, a lawsuit was commenced by the biker alleging significant injuries and medical expenses. Although my father had a primary and umbrella insurance policy for his auto, his umbrella insurer informed him that his insurance agent failed to obtain the necessary liability limits for the primary policy. As a result, there was a $250,000 gap in my father’s insurance coverage. Due to my father’s personal exposure for the $250,000 gap, we hired John. After reviewing the policies and deposing my father’s insurance agent, John was able to persuade the insurance agent’s errors & omissions insurer to contribute a significant amount to the settlement with the plaintiff. The result: my father received a full release from the injured biker without losing any of his personal assets. I would strongly recommend John to anyone who is faced with a lawsuit and possible exposure to their personal assets. John and his wife are proud parents of a son who works in the food service industry in the Twin Cities and a daughter who graduated from the University of Michigan and works for an advertising agency in Chicago. During his free time, he enjoys sailing, hockey, and biking.